In order to film a new feature, Hank pretends to be his dad. Mavis and Wendy act as matchmakers by setting up Lydia with Bob Blob. Mavis wants to prove she can care for a living creature by rescuing a bad egg. The kids try to watch the last episode of their favorite show, Hotel Pennsylvania. Mavis tries to save Creepmas. 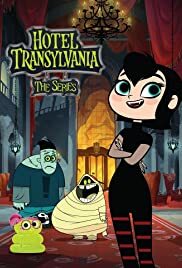 Hotel Transylvania the series is funner and zanier than the original source. Love the writing and voice acting. Mavis is great and deserves to be the star. Love how fast she zooms around. This voice actor has way more energy than Selena Gomez of the movies, who is makes Mavis too flat and bland. The 11 minute episode format leaves no room for melodrama and sappy stuff like the movies have. It's just fun. Great cameo characters too like Medusa. Haven't experienced a lot of predictable or stereotypical monster stuff. They have free reign to create lore which is refreshing. Recently watched the new Ducktales. I immediately noticed the art was not up to par with HT. HT art is top notch. The music is great too with a mix of punk, hip hop, mariachi,etc. HT the series is pretty much the highlight of my week.